NEW VOICES: Author of California Death Penalty Says "It is time to undo it"
In an op-ed for the Los Angeles Daily News, Don Heller (pictured), a Republican, former prosecutor, and the author of the 1978 ballot initiative that reinstated California's death penalty, voiced his support for replacing the death penalty with life without parole. "It makes no sense to prop up such a failed system," he wrote. He urged California voters to support a new ballot initiative that would abolish the state's death penalty, citing the system's "staggering" costs and the risk of executing the innocent. In discussing the failures of the initiative he authored over 30 years ago, he said, "I never contemplated the staggering cost of implementing the death penalty: more than $4 billion to date and approximately $185 million projected per year in ongoing costs." He said he also did not think about the chance that an innocent person could be executed: "I am convinced that at least one innocent person may have been executed under the current death penalty law. It was not my intent nor do I believe that of the voters who overwhelmingly enacted the death penalty law in 1978. We did not consider that horrific possibility." Heller emphasized that he is not "soft on crime," but that "life without parole protects public safety better than a death sentence." Additionally, he said the money spent on the death penalty could be better used elsewhere, as California cuts funding for police officers and prosecutors. "Paradoxically, the cost of capital punishment takes away funds that could be used to enhance public safety." Read full op-ed below. Read more about NEW VOICES: Author of California Death Penalty Says "It is time to undo it"
On June 8, Ohio Governor John Kasich (pictured) granted clemency to Shawn Hawkins, commuting his death sentence to life without parole because of doubts about his role in a double murder. Hawkins was scheduled for execution on June 14. In May, the Ohio Parole Board unanimously recommended to spare Hawkins’ life, citing conflicting statements by the sole eyewitness and possible involvement of other individuals who had not been fully investigated. Republicans Ken Blackwell, a former Ohio Secretary of State and 2006 gubernatorial candidate, former Ohio Attorney General Jim Petro, and state Sen. Bill Seitz all wrote letters to Gov. John Kasich or to the Parole Board on behalf of Hawkins. Sen. Seitz stated, "[T]here is no reason to end Mr. Hawkins' life on something so utterly flimsy as mishandled and inconclusive fingerprints and the testimony of a witness with every motive to lie. . . ." Hawkins is the first death row inmate to receive clemency from Governor Kasich since he took office in January, and the seventh to be spared since Ohio resumed executions in 1999. Current and former law enforcement officials in California recently discussed their views on the future of the death penalty during a conference in San Francisco. 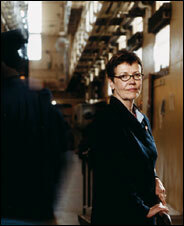 Jeanne Woodford (pictured left), former Warden of San Quentin prison, said that the time has come to end executions in the United States: "I have had the opportunity to view this issue from every point of view. I absolutely am passionate about the position that it's time to end the death penalty in the United States." She recommended life in prison without possibility of parole as an alternative to the death penalty, saying that it "is a real sentence," but one that "gives inmates opportunity to change, to work, to give back to state, and to make restitution to the victims' families." George Gascon (pictured right), San Francisco's District Attorney, said the death penalty "is an imperfect tool." He cited the possibility of wrongful convictions, the high costs of executions, and the lack of closure for victims' families. Nebraska's unicameral legislature passed a bill to repeal the state's death penalty and replace it with a sentence of life without parole. On May 20, the bill passed its third and final round of debate on a 32-15 vote, receiving bipartisan support. Senator Al Davis said, "There are so many reasons why we need to eliminate the death penalty in Nebraska. It's fundamentally unfair, a terrible mistake and bad justice." Gov. Pete Ricketts has indicated that he will veto the bill, but a veto can be overridden with the support of 30 senators. The bill is prospective only, so if it becomes law, it will not affect the 11 inmates currently on Nebraska's death row. Nebraska has executed three prisoners, all by electrocution, since re-enacting the death penalty in the 1970s. Its last execution was in December 1997. The family of a man who was killed in Ohio recently petitioned the parole board to commute the death sentence of the defendant in the murder. Peter Mah, son of Chong Hoon Mah, who was killed by Johnnie Baston (pictured) during a robbery in 1994, told the Ohio Parole Board, "I was opposed to Mr. Baston receiving a death sentence at the time of his trial… [and] my family and I are opposed to Mr. Baston being executed." During the trial, the family had filed affidavits saying that they preferred to see Baston spend his entire life in prison, but that sentencing option was not available at the time. The Board makes a recommendation regarding clemency to the governor, who makes the final decision. Baston's attorneys have compared his case to that of Jeffrey Hill of Ohio, whose death sentence was commuted to life without parole by former Governor Ted Strickland. In Hill's case, the parole board cited the wishes of the victim's family opposing execution. Baston's attorneys have also presented evidence that he was abused as a child by his birth family. On consecutive days, Governor Jay Nixon of Missouri and Governor Phil Bredesen of Tennessee granted clemencies to death row inmates facing imminent execution in their respective states. In Missouri, Gov. Nixon commuted the death sentence of Richard Clay, who was scheduled for execution on January 12. In Tennessee, Gov. Bredesen granted clemency to Edward Jerome Harbison, thus averting his execution on February 15. Both inmates now face life in prison without parole. Clay and his supporters maintained that he was innocent of a 1994 murder-for-hire murder. In a statement released by the governor's office, Nixon said that Clay's "involvement in this crime is clear," but chose to exercise his executive authority after “having looked at this matter in its entirety and after significant thought and counsel.” In Tennessee, Harbison was charged with a murder that occurred in 1983. He initially confessed to the crime but later claimed he was coerced after authorities threatened to arrest his girlfriend and put her children into foster care. Of the commutation, Gov. Bredesen said, "It's obviously a heinous crime, but when I compare it to others I don't think it rose to the level of a death penalty crime." Gov. Nixon was elected in 2008, having served as Attorney General while Clay was being prosecuted. Gov. Bredesen is leaving office.